Medical experts fear that Russia’s diabetes issue is approaching “epidemic” proportions. Despite the relative effectiveness of the latest treatment methods, Russia’s lack of a unified strategy, innovative medications, and a comprehensive approach are preventing the country from achieving serious results on a nationwide scale. According to official statistics, more than 3 million Russians have diabetes. Some 300,000 Russian diabetics have Type 1 diabetes, which means their bodies completely lack insulin. However, according to specialists at the Endocrinology Research Center, the actual numbers are much higher. If the situation continues along its current course, experts believe the number of diabetics in Russia could double by 2025, and will include more and more young people. Today, some 30,000 children and teenagers suffer from the disease in Russia. The most common kind of diabetes is Type 2, in which the body develops an inability to use insulin properly, resulting in high blood sugar levels. “The onset of Type 2 diabetes depends on external factors. This disease is a reaction to various types of stress, which are amplified year after year in the modern world,” explains endocrinologist Yekaterina Krivstova, who is vice president of the Interdisciplinary Scientific Community of Obesity Prevention and Treatment. “It is also a hereditary disease that is passed down from generation to generation, which is why the number of diabetics is growing over time,” she adds. The increased incidence of diabetes is primarily due to bad nutrition, Krivstova says, noting that around 67 percent of the food sold at Russian grocery stores is packed with carbohydrates. “Carb-rich foods are cheaper, they are often advertised in an ostentatious way, and people eat a lot of harmful junk. Another problem is a lack of exercise,” she says. Russia spends approximately $10 billion per year on diabetes prevention and treatment. One advantage the country holds is that it has boasted a unique system of specialized sanatoria and health resorts since Soviet times. 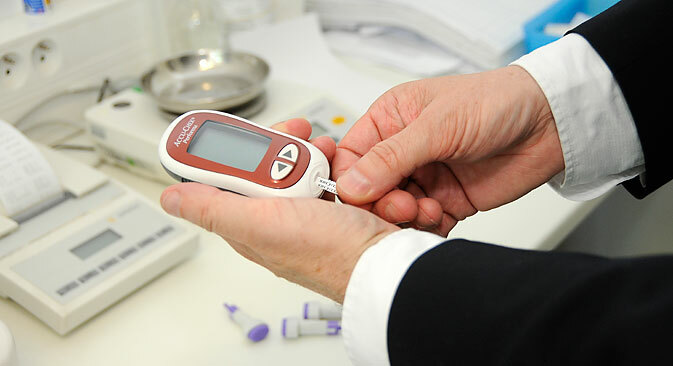 “Every year we send tens of thousands of diabetics to these institutions,” said Marina Shestakova, deputy director of federal state institution Endocrinology Research Center and corresponding member of the Russian Academy of Medical Sciences. “But the problem is that people go home after feeling better and resume their former way of life, which is what caused the illness in the first place,” she added. A few years ago, sports doctor Boris Zherlygin and medical experts from the Russian space agency Roscosmos developed a way to treat Type 2 diabetes. The method was simple: particular physical exercises in conjunction with medicine. However, official medicine does not confirm the efficacy of this method. “I personally put a whole lot of effort into Zherlygin’s idea. We developed the methods together and used them. I should say that the results were positive. People were cured quickly in several cases. But his idea didn’t survive to the final stage of completion,” says Ivan Neumyvakin, MD, the former head doctor at Roscosmos. In Shestakova’s estimate, Russian drugs lag behind their Western counterparts. They are used only for certain symptoms and forms of diabetes, when there is no sense in paying over the odds for foreign medicines. The most promising avenue, which Russian scientists are only now working on due to a lack of financing, is the development of two classes of drugs that are similar to dipeptidyl peptidase inhibitors (DPP-1) and glucagon-like peptides (GLP-1), which already exist in the United States and Europe. “The government bought apparatus and equipment for diagnosing and treating diabetes for all regional and territorial hospitals from 2007 to 2012,” says Shestakova. “Doctors took retraining courses at the government’s expense, and the program worked. But it was suspended, and financing was shifted to the regional and municipal budgets. The situation is even worse with R&D. The vast majority of drugs used by Russian patients are foreign,” she says. Meanwhile, Russian research centers are continuing to work on diabetes treatments. Not long ago, the Sklifosovsky Institute of Emergency Care and the Institute of Biomedical Problems in Moscow performed joint research on the drug Diabecell from New Zealand, which contains the pancreatic cells of newborn piglets. The cells were transplanted into four patients, and the patients’ need for insulin subsequently declined by 40 percent. One of the patients completely rejected insulin for a time. However, doctors fear that animal material could contain latent infections, so they are in no hurry to adopt the method until they get the green light from the Ministry of Health.